Open the can of diced tomatoes and place it in the blender. Whiz it up till its nice and smooth. Pour it into a large bowl. Dice up all your veggies and add them to the bowl with the blended tomatoes. Mince the garlic or put it through a press and add it as well. Chop the dill and add it to the bowl. Then add the salt, pepper and olive oil. Stir well and taste it. Add more salt and pepper as needed. 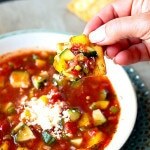 Chill the gazpacho for at least half an hour in the fridge and let all the flavors meld together. When you are ready to serve, ladle the soup into bowls and top each bowl with a little feta cheese. Wear gloves to chop the jalapenos! Also, if you dont like onions because they are too strong, try soaking them in a little bit of water for 5 - 10 mins. It really takes the bite out of the onion and just leaves the flavor.